Our domain expertise has enabled us to come up with an excellent collection of Three Sink Unit. 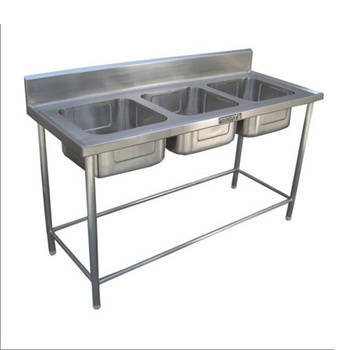 The sink unit made available by us is extensively used in hotels, restaurants, canteens and other related places for manually and hygienically washing and cleaning different kitchen accessories. Superior quality material is used to manufacture the offered sink units. Sequel Kitchen Equipments ( A Unit of Pushpa Gas Equipments) is established in the year 1990. This is an ISO 9001:2015 certified company.We are the manufacturer and supplier of Commercial Kitchen Equipments and Utility Equipment. These gas kitchen appliance, commercial hospitality equipment are widely demanded by various hotels, hospitals, embassies, resorts, industries and educational, professional institutions. In addition, we also meet the requirements of cooling equipment, kitchen refrigeration equipment, commercial dish-washing equipment, kitchen exhaust system, exhaust hoods and L.P.G gas system including gas banks. Our range includes commercial hospitality equipment, catering kitchen equipment, commercial dish-washing equipment, kitchen refrigeration equipment, gas kitchen appliance, four burner range with oven, chapati plate with puffer, cold bain marie counter, masala trolley, kitchen storage racks, pizza oven, hot case counter, pot wash sink and island kitchen. All our commercial kitchen equipment are used for different purposes such as food preparation, cooking, frying, washing, refrigeration and storage. These commercial hospitality equipment, gas kitchen appliance are developed using stainless steel and other material, which ensures in them high durability standards. We also use innovative technology in its manufacturing, which is carried out by our experts, under the guidance of our owner Mr. Gorakhnath Salunkhe. He has tremendous experience in this domain, which enables us to acquire high repute in the segment of kitchen equipment. His process expertise enables us to also offer customized solutions to our customers for our range of equipment, in terms of sizes and finishes.